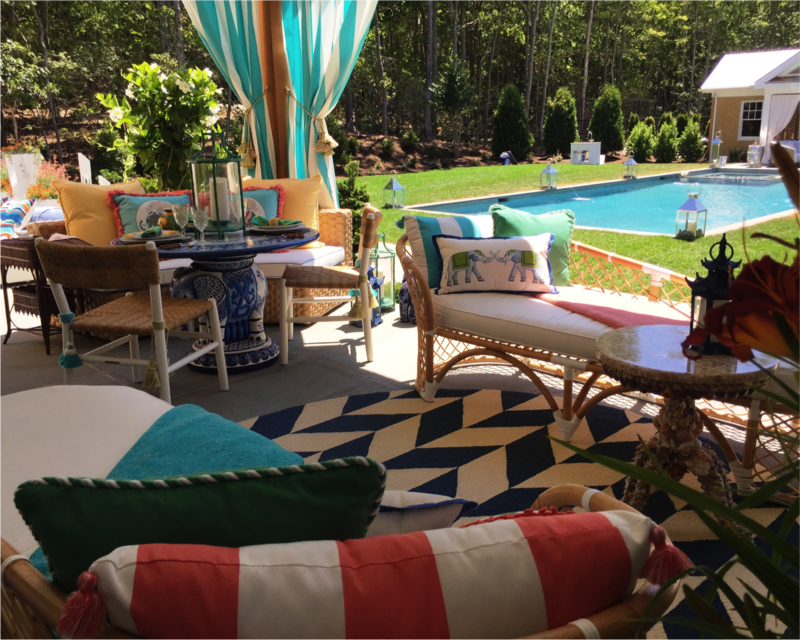 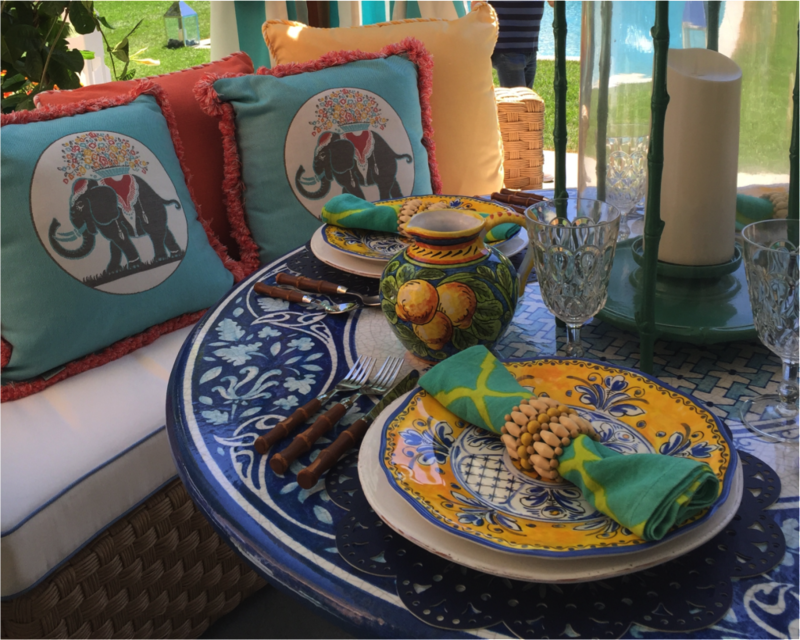 We often attend design industry events around the country, but one of our absolute favorites is the Premier Gala for the Hampton Designer Show House benefiting Southampton Hospital and presented by always tasteful Traditional Home Magazine. The surf and sand, as well as the glitz and glam of some of the industry’s top designers are on display for the next six weeks. 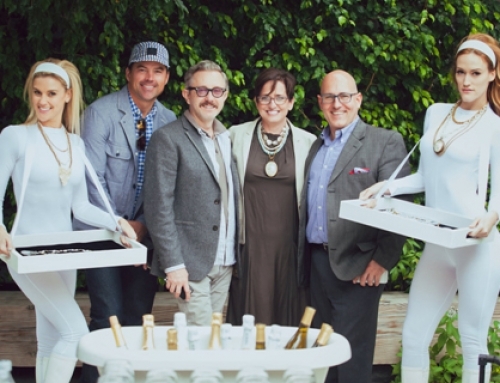 Not only were we stunned by the phenomenal work of the Show House designers, we were able to catch up with so many old friends who traveled from the West Coast, the South, and the Midwest to support the design community and this very deserving charity. 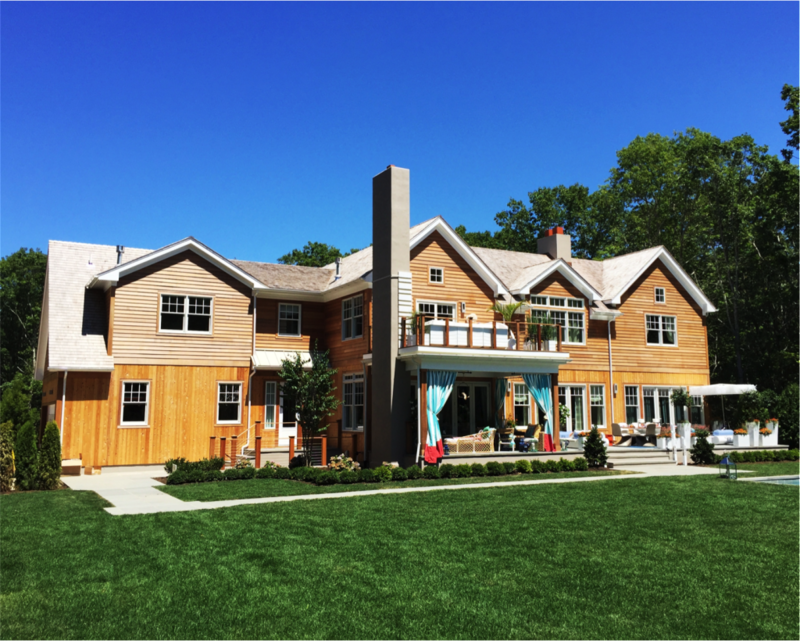 This year’s spectacular home, built by award winning Christopher Tufo Design & Build, is a modern take on the classic barn style of architecture, grounded and earthy with clean lines. 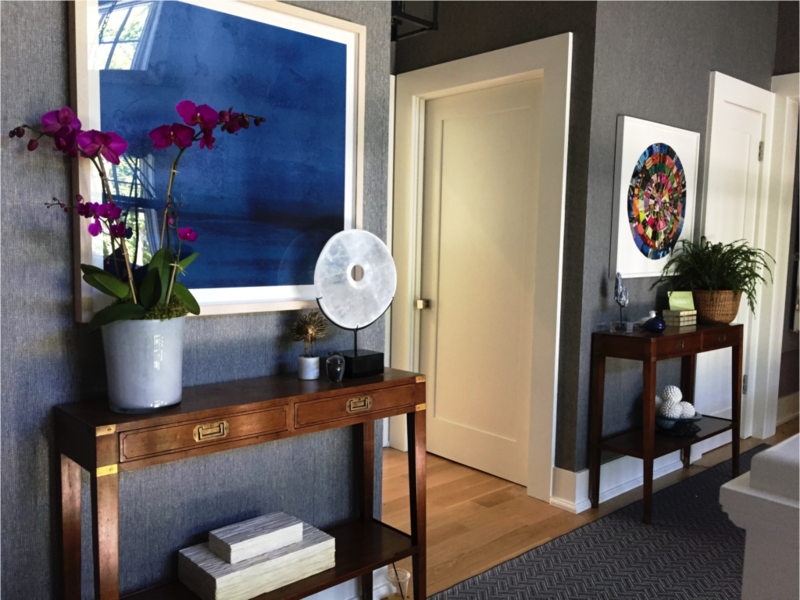 Our first step into the home’s foyer, created by Elissa Grayer Interior Design, is at once welcoming and visually stunning. 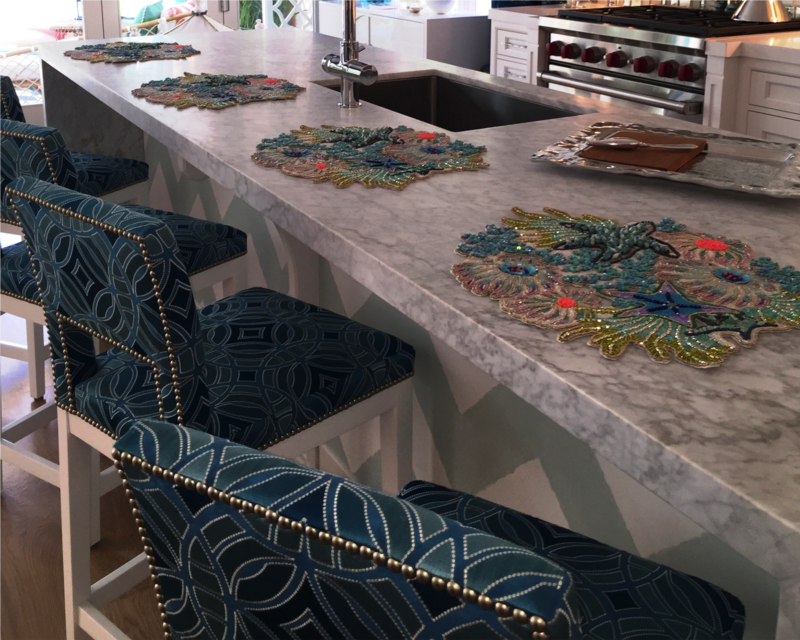 With colorful artwork by Yolanda Sanchez and rich textures of leather, grass cloth by Thibaut, artisan woven chairs, and beautifully shaped upholstery by the Kristin Drohan Collection you’re welcomed to take off your shoes and stay awhile. Patricia Fisher’s spacious living room is softly sophisticated using contemporary and mid-century furnishings to invite conversation. An Atlanta favorite, Robert Brown gives a masculine savoir vivre to the library. 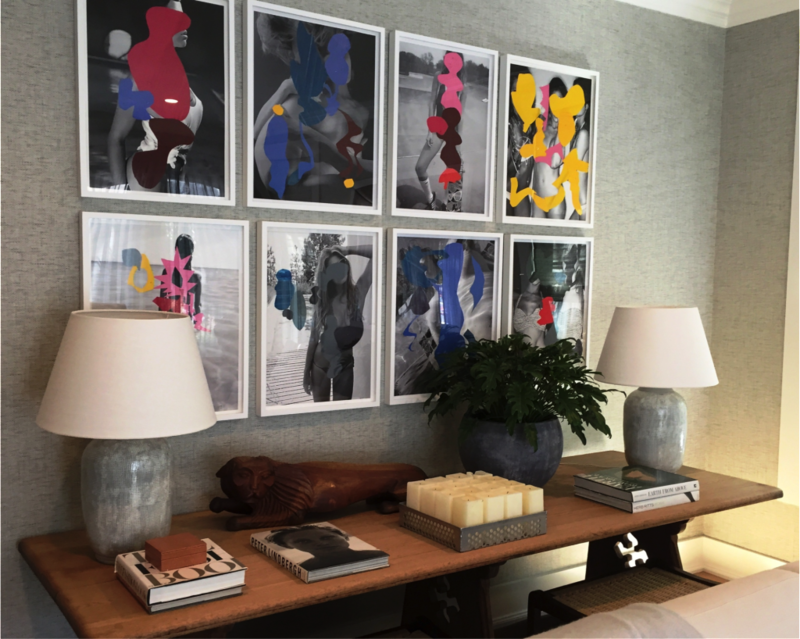 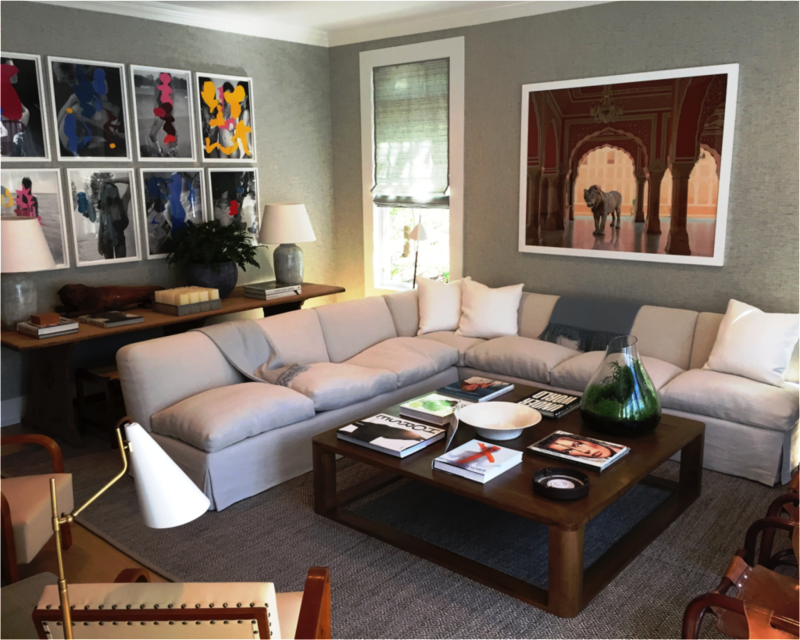 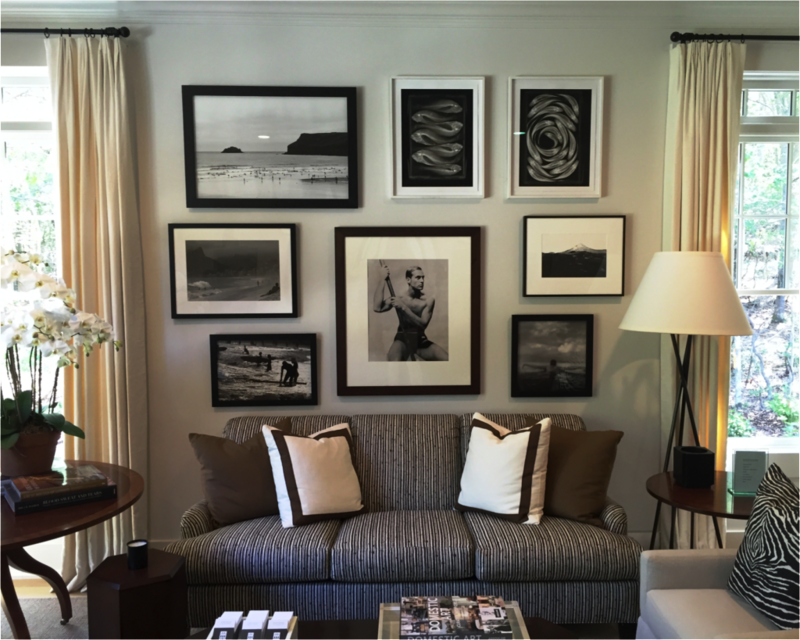 Refined, yet comfortable upholstery by Wesley Hall framed by a beautifully curated wall of artwork. 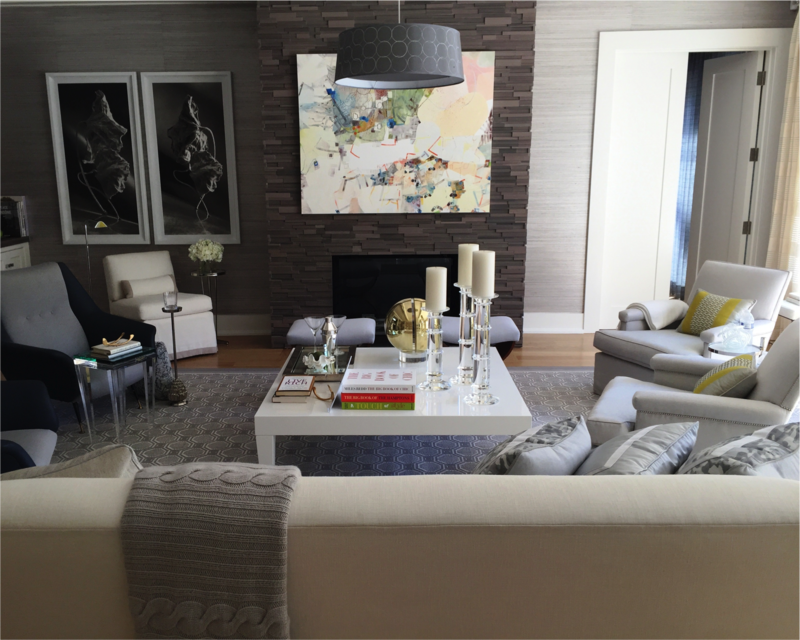 The most striking element of the family room designed by the men of Brady Design was not any one element in the room but the consistent scale of all of them. 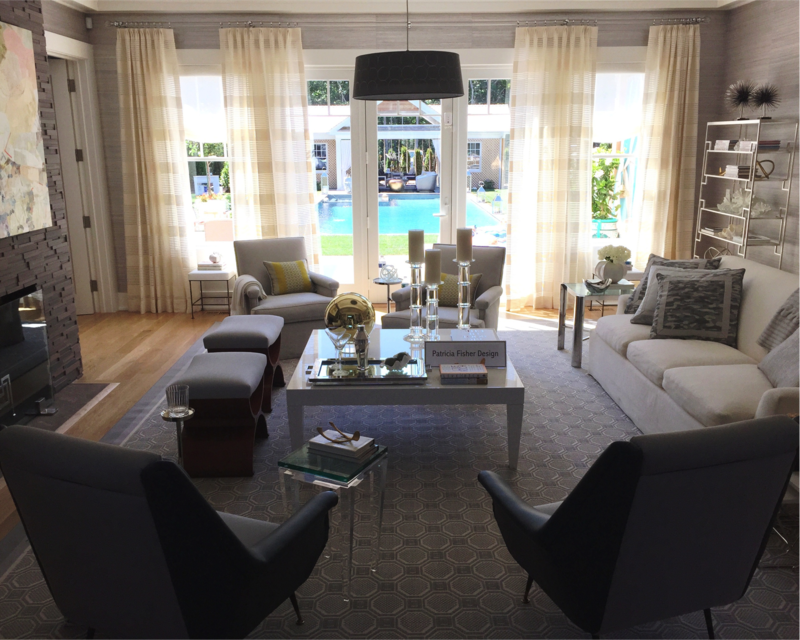 Everything took on a larger than life feel, bringing the room into balance. 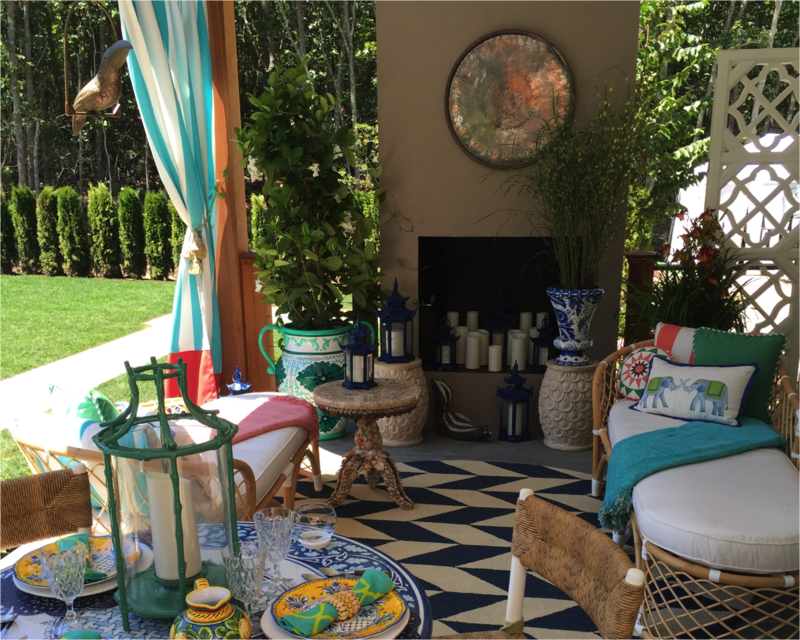 We especially loved the vintage Hermes chairs! 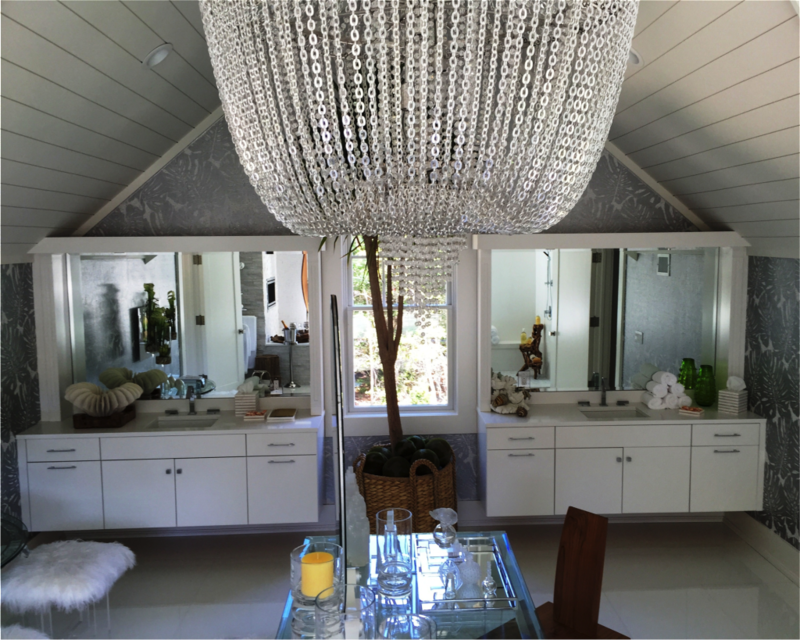 The kitchen goes glam! 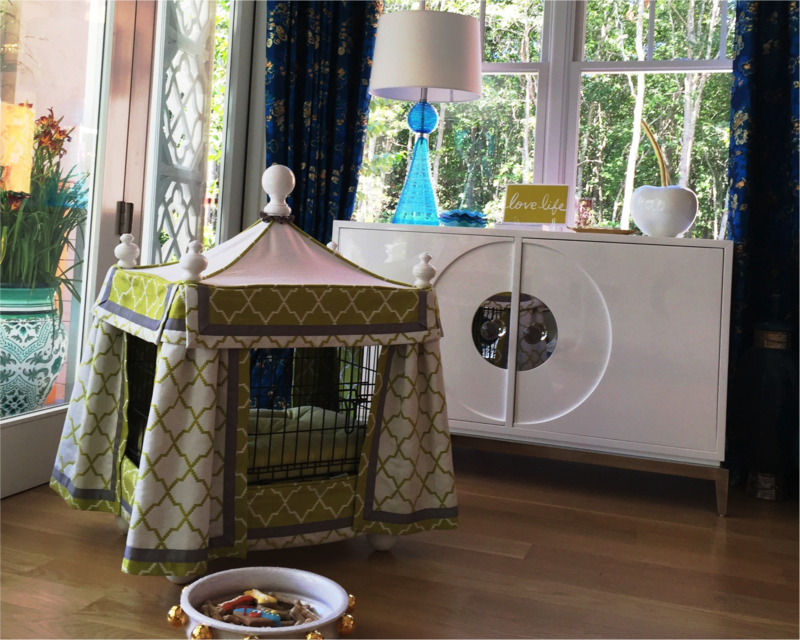 Marlaina Teich created an enchanting and accessible space to gather, cook, and even relax with the pup, all in high style. 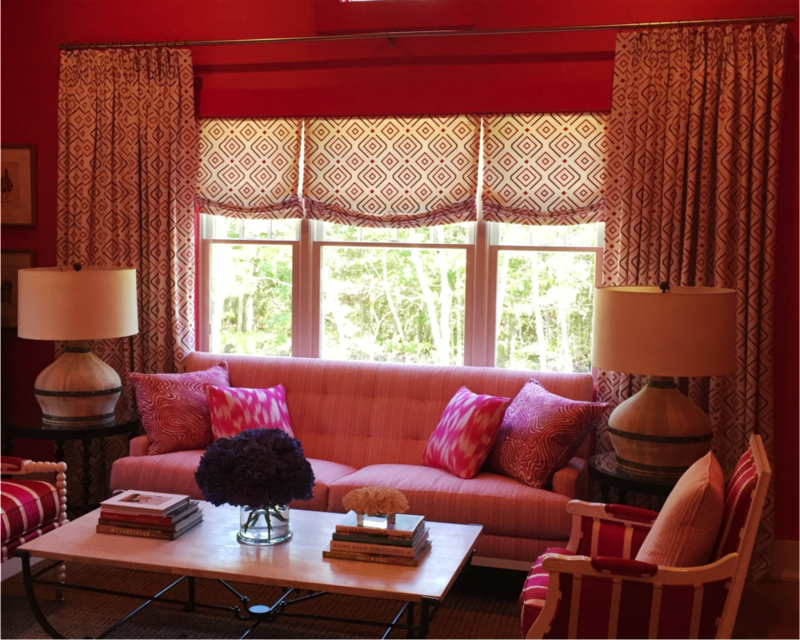 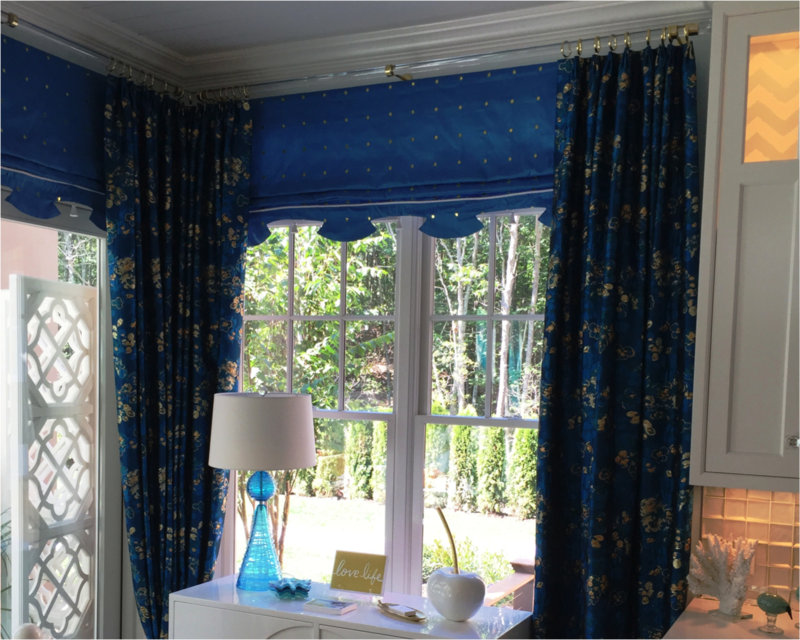 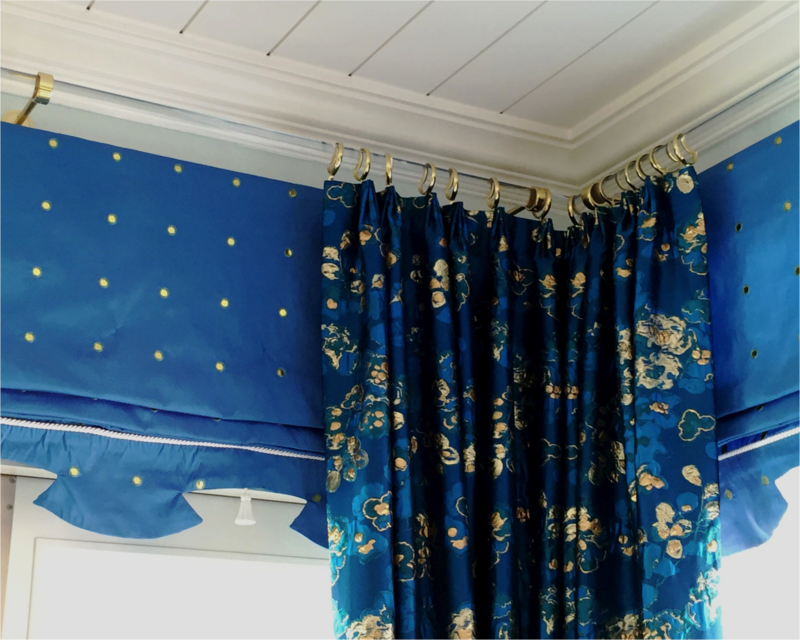 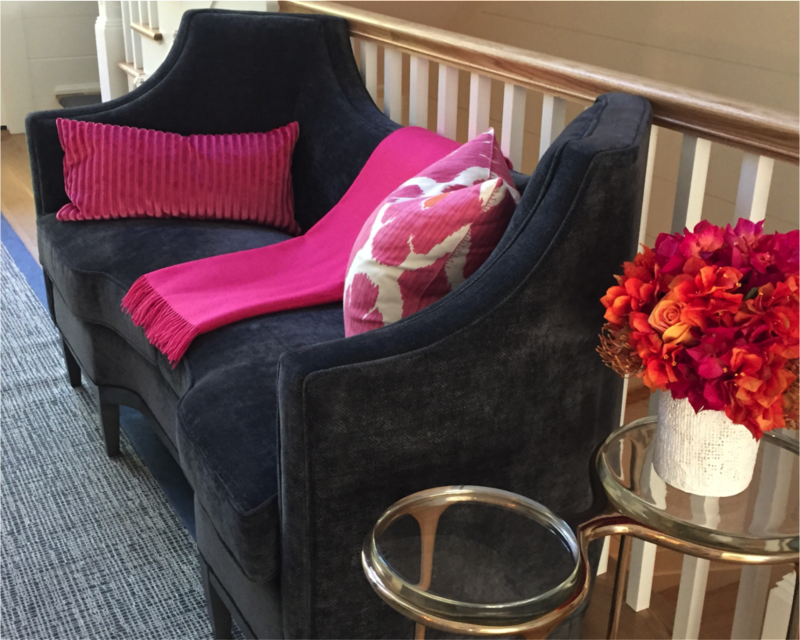 Rich color from fabrics by Robert Allen Design draped and built by Marks and Tavano studio workroom in Manhattan. A glossy sideboard from Jonathan Adler and a beautiful handknit rug from Susan Serra’s Scandiavian Made give the room function and form. 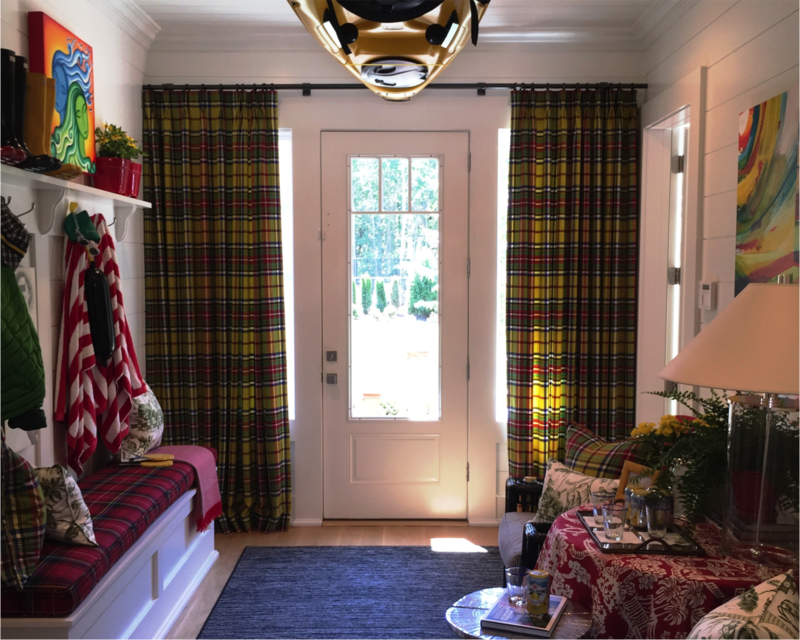 The mud room, elevated… Scott Meacham Wood’s take on the lowly mudroom is rich and textured with a touch of whimsy brought about through the use of his signature line of plaid fabric made contemporary with acid lime tones. 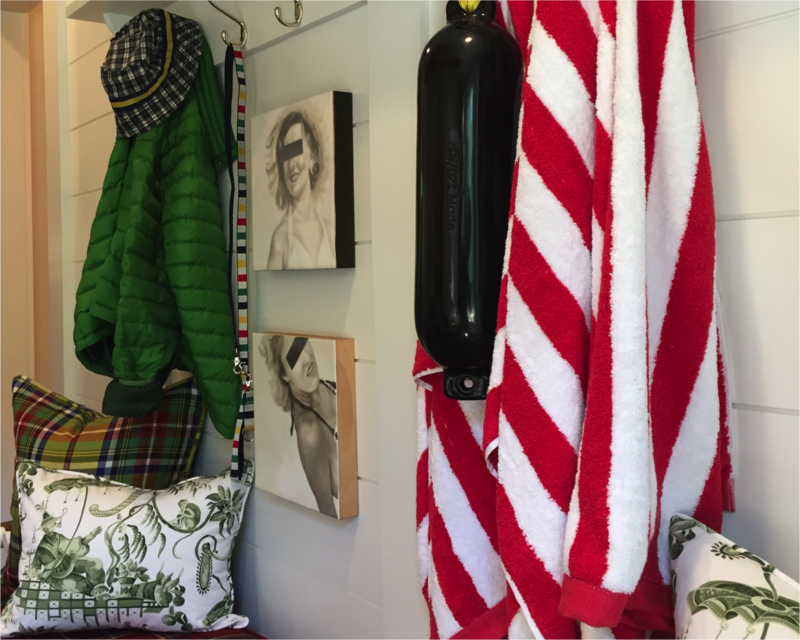 Functional and fun, we loved the hanging kayak! As we head upstairs, our Dallas Diva, Denise McGaha, gives us a beach house guest room with true sophistication. 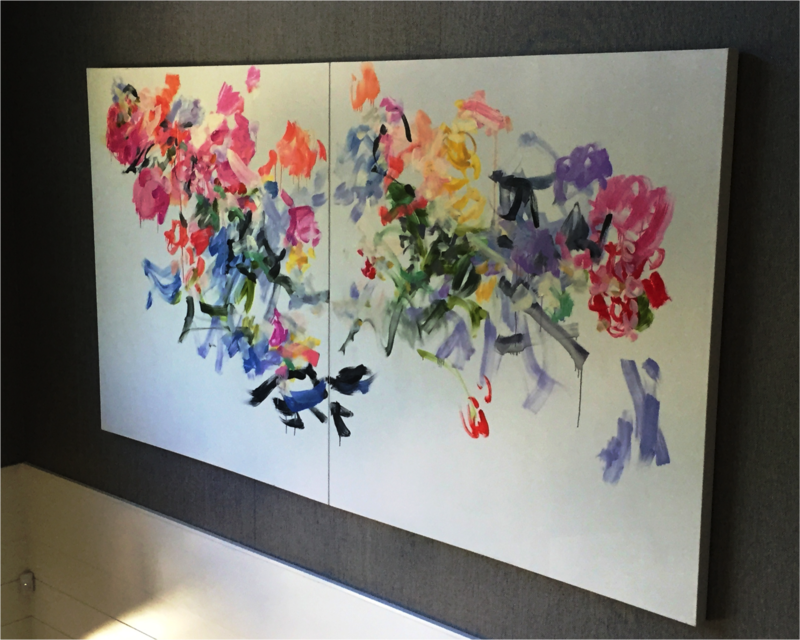 Deep rich hues and layer upon layer of detail to hold your attention throughout. 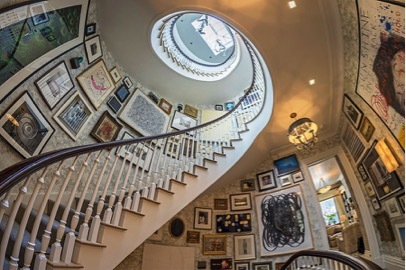 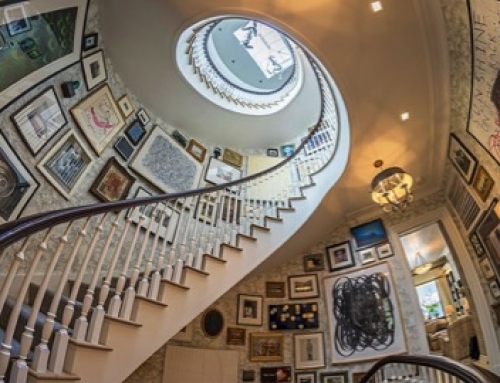 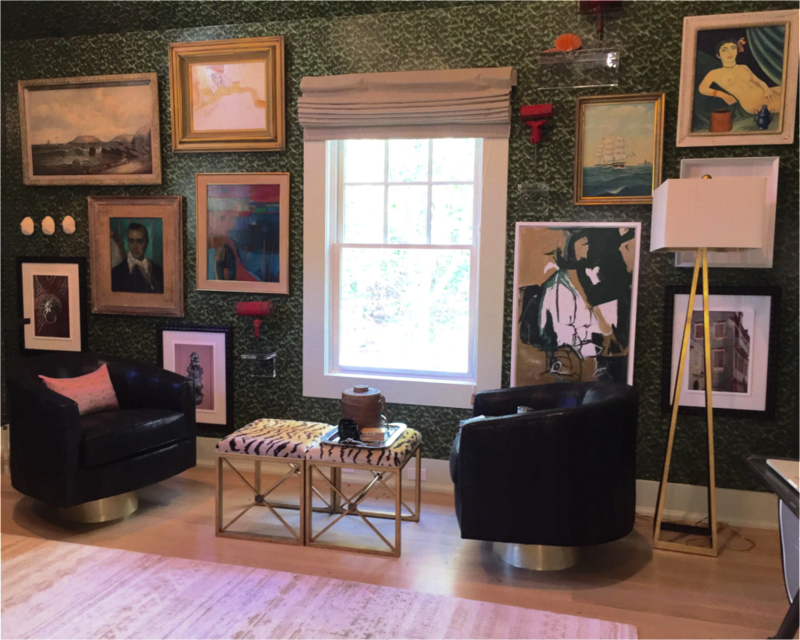 A tremendous wall of artwork including artist Kelly O’Neal of Design Legacy is a strong focal point of the room. 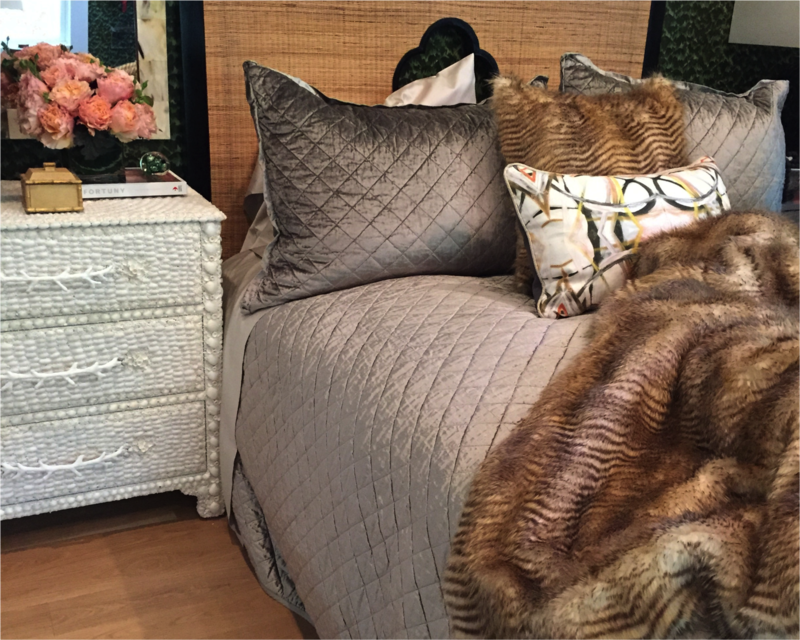 Lee Jofa’s luxurious fabrics are invite a cozy night’s rest. A standout with the use of color is Brian Patrick Flynn’s Sitting Room. 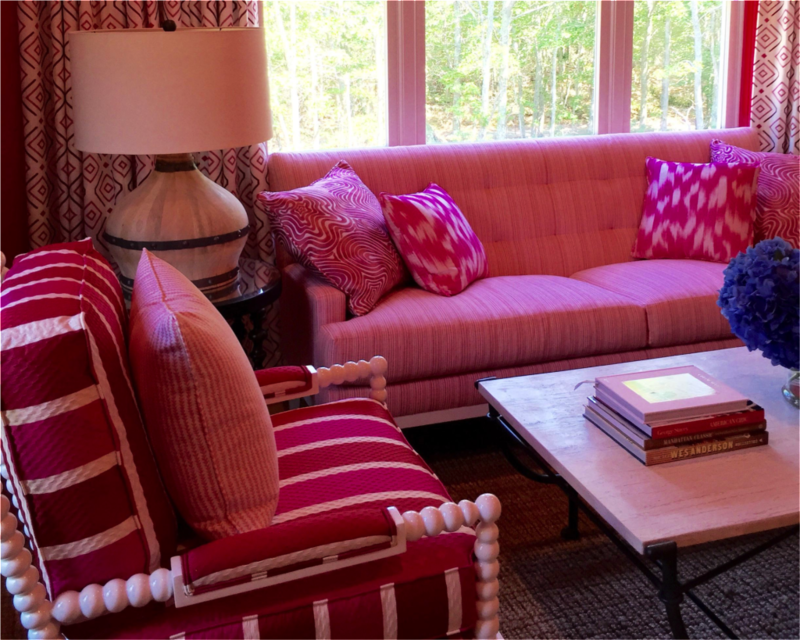 Pink is the order of the day with an incredibly saturated grasscloth by Thibaut, and fantastic furniture and fabrics from Duralee. 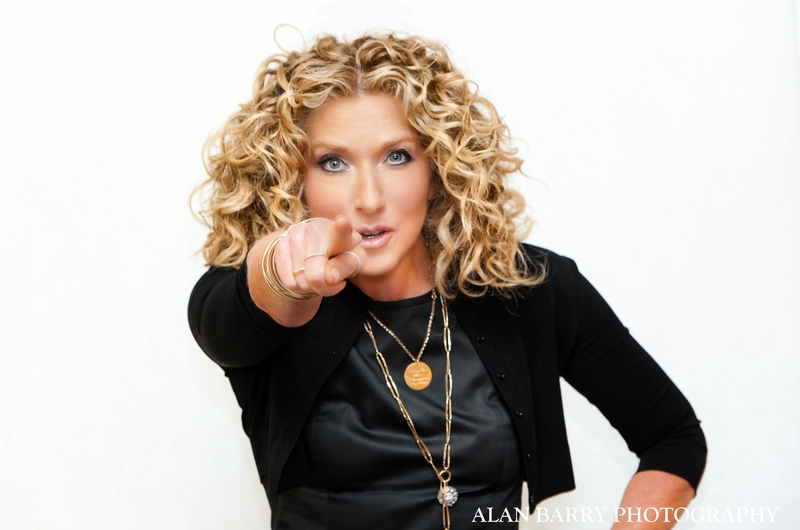 Youthful, energetic and a bit satirical. 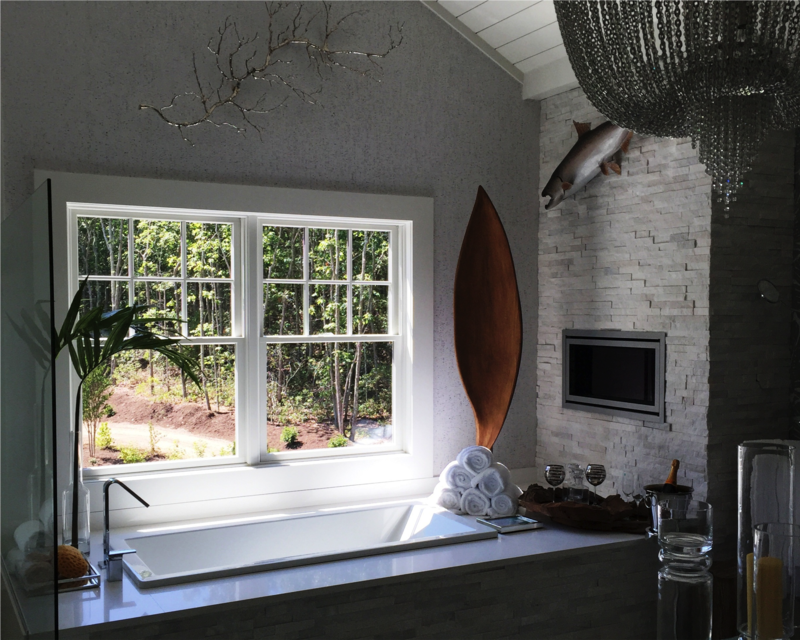 The Master Bath by Keith Baltimore is a land unto itself. 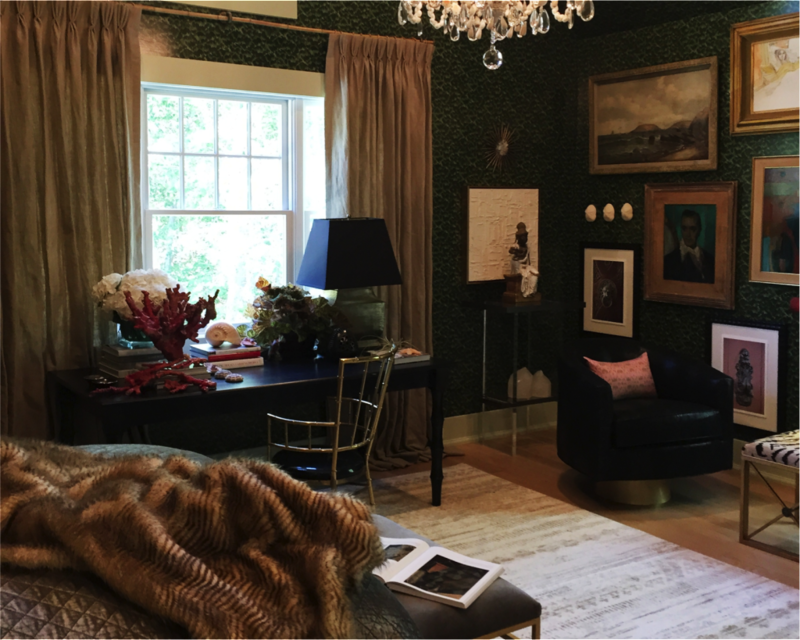 Elegant Lalique and a new line of cork wall coverings by Phillip Jeffries set the stage for a glamorous retreat. 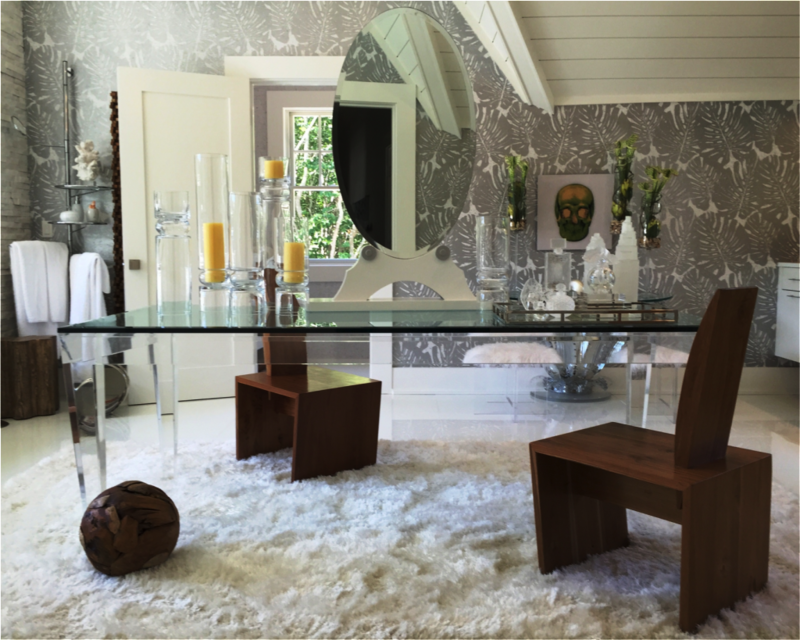 The juxtaposition of shiny metallics and glass against rich warm woods strikes the perfect balance. 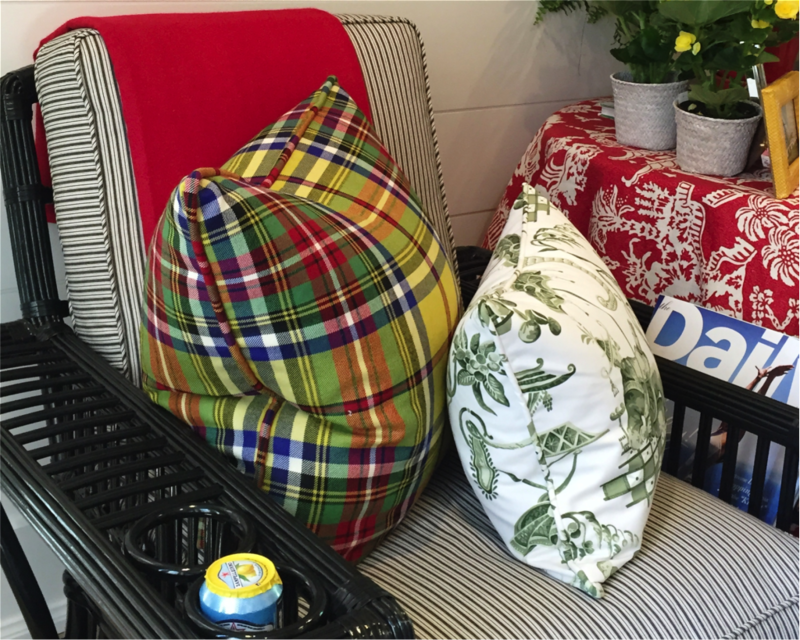 Transforming the outdoors with their well established flair, the boys from Madcap Cottage have created an oasis in the typically forgotten. 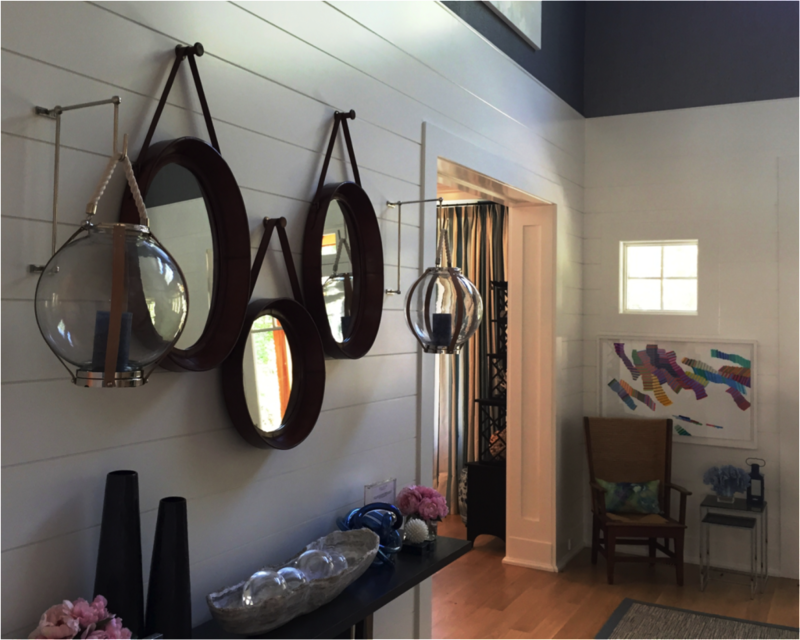 Tons of color and space to nap and nosh, we adored this Frontgate inspired space.